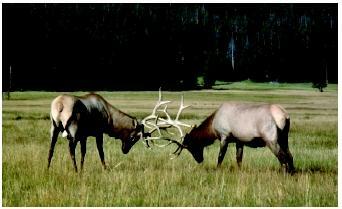 Elk fighting for dominance in a Wyoming herd. Common patterns of behavior are exhibited by many species. accomplish these basic goals, including communication behavior, territorial behavior, dispersal behavior, and social behavior. Although some animals are able to reproduce asexually (such as some insects and a few species of lizards), most animals must find a mate in order to reproduce. In many cases, one of the individuals, usually the male, tries to attract a mate by performing a courtship display. This is often a visual display, as is the case with the peacock and many species of coral reef fish. Studies have shown that the females select males partly on the basis of their courtship displays. Scientists believe that vigorous and brightly colored displays might signal to the female that the male is strong and healthy. Thus, mating behavior plays an important role in determining which genes get passed on to the next generation. Animals exhibit several different types of foraging behavior. Some animals are quite selective in what they eat. These animals are called foraging specialists. For example, the diet of the lynx consists primarily of snowshoe hares. Some species of insects feed only on a single plant species; they are the ultimate feeding specialists. Other animals are generalists, eating a wide variety of food types. An example of a foraging generalist is the opossum, which eats everything from insects and berries to garbage. It is thought that natural selection has favored many animals to forage in an efficient manner. This means that the animals make feeding choices that maximize the amount of energy they can obtain in the shortest time possible. This type of foraging, sometimes referred to as "optimal foraging," leaves the animal with more time and energy for other important activities, such as finding a mate or caring for offspring. Virtually all animals are vulnerable to predation (being eaten by another animal) at least some time during their lives. Even wolves and lions can be prey for other animals when they are very young. As a result, animals from worms to whales have evolved ways to reduce the likelihood they are eaten. This behavior, often referred to as defensive, or antipredator, behavior, can take many forms. Some animals, such as many moths and lizards, try to blend in with their surroundings so the predator cannot see them. This is called cryptic behavior. Other species have evolved effective escape behaviors, such as fast-running antelope and fast-swimming fish. Others fight back with stinging or biting behavior. In many cases, prey can deter predators with a threat display. Threat displays are special behaviors that tell the predator that the prey may fight back ferociously. A raccoon that bares its teeth and growls when cornered by a predator is giving such a threat display. As illustrated above, effective communication behavior is vital for an animal. Besides communicating with sight and sound, some animals communicate using chemicals. For example, male moths find mates by detecting special chemicals called pheromones that the females release into the air. Ants also use pheromones to determine if another ant is an intruder or a member of the colony. Setting up and maintaining a territory is another common pattern of behavior exhibited by many species of insects, fish, birds, reptiles, and mammals. Territories are used for a variety of purposes, including feeding, mating, and caring for offspring. The territory owner normally tries to keep other individuals of its species out of the territory. Other patterns of behavior include dispersal behavior, exhibited when individuals move away from the area in which they were born, and many types of social behavior. Social behavior is particularly common in animals that live in groups, such as ants, penguins, and primates. In all cases, scientists believe that these patterns of behavior have evolved over time because they have increased the ability of animals to survive and reproduce. Alcock, John. Animal Behavior: An Evolutionary Approach, 6th ed. Sunderland, MA: Sinauer Associates, Inc., 1997.